You can read the original article, with photos, online here. This was the first of many stories published in London, and I really appreciate the time and effort Tim Masters took to research and write the story. It was a really popular article on the BBC’s website, and even ended up on the front page! 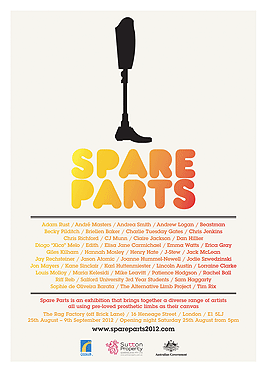 Spare Parts, an exhibition of prosthetic limbs transformed into pieces of art, is being staged in London later this month to coincide with the Paralympic Games. 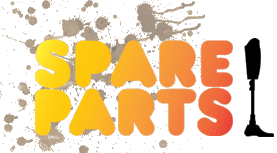 Priscilla Sutton came up with the idea for Spare Parts when she was cleaning out her house in Australia. “I pulled a couple of old legs out of the cupboard, and realised I couldn’t keep hoarding limbs for sentimental reasons,” she explains. So the Queensland-born curator, an amputee since 2005, asked her creative friends to turn them into artworks she could hang on the wall. Spare Parts had its first outing in Brisbane in 2010. It brought together dozens of artists who were given pre-loved prosthetic limbs as a blank canvas. Now a new batch of prosthetics has been donated for the second Spare Parts exhibition on London’s Brick Lane. Of the 43 artworks, only five were part of the original Brisbane show. Ms Sutton is now in London putting together the exhibits while on a break from her hospital job in Australia. She sourced most of the limbs via the NHS, and put out a call for artists via the Arts Council. “I do tend to get lots of people contacting me saying ‘hey – I hear you want a leg! '” she laughs when we meet in London’s West End with less than three weeks before launch. 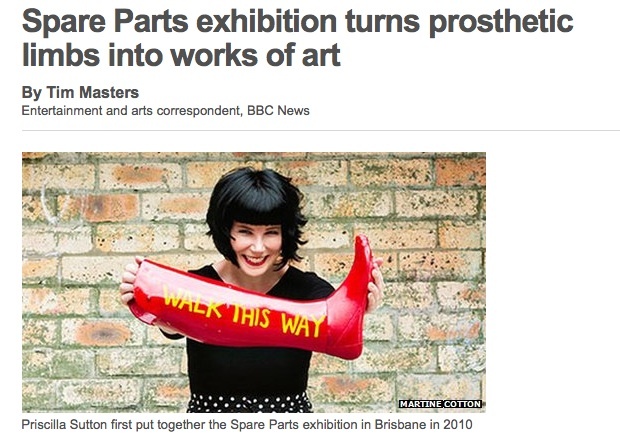 All this begs the question of how well does a prosthetic limb lend itself to an artwork? “It’s not a square canvas, and it can be soft and squidgy or as hard as titanium,” she says. In November 2005, Ms Sutton had elective surgery below the knee to remove a worsening bone condition. She was 26 years old. Earlier this year, she wrote an engaging and honest piece for Australia’s ABC website about the most common (and personal) questions she gets asked about being an amputee. In it she describes what happened to her leg after it was removed. “Some people seem to think that when you get out of hospital you get to take your leg home, in a jar. You don’t. But in my case, I did have my leg cremated. Ms Sutton notes that some of the artists for the London show have used a prosthetic arm or hand to draw or paint their contributions. The list of artists taking part includes Andrew Logan, Beastman, Dan Hillier, Elisa Jane Carmichael and tattooists Henry Hate and Louis Molloy, known for their work with Amy Winehouse and David Beckham respectively. Priscilla Sutton uses two prosthetic legs: one for sports, decorated with brightly-coloured Japanese fabric, and one she describes as her “going out leg” – featuring printed artwork by US pop surrealist Mark Ryden. Ms Sutton says that high-profile people like South African athlete Oscar Pistorius – known as the Blade Runner – are also sending out positive messages about people with prosthetic limbs. Last week Pistorius became the first amputee athlete to compete at the Olympics, running on carbon fibre blades in the men’s 400 metres race. “I was screaming at the television!” Sutton admits. “He is an inspiration. As an amputee I’m so proud of Oscar Pistorius, of his achievements and attitude. He isn’t about being different, he is about being fit and healthy and achieving goals. A “cheetah leg” of the type used by Pistorius has been donated to Spare Parts by manufacturer Ossur, also a sponsor of the exhibition. While Spare Parts is not an official Paralympic event, Ms Sutton says now is the right time to bring the exhibition to the UK. 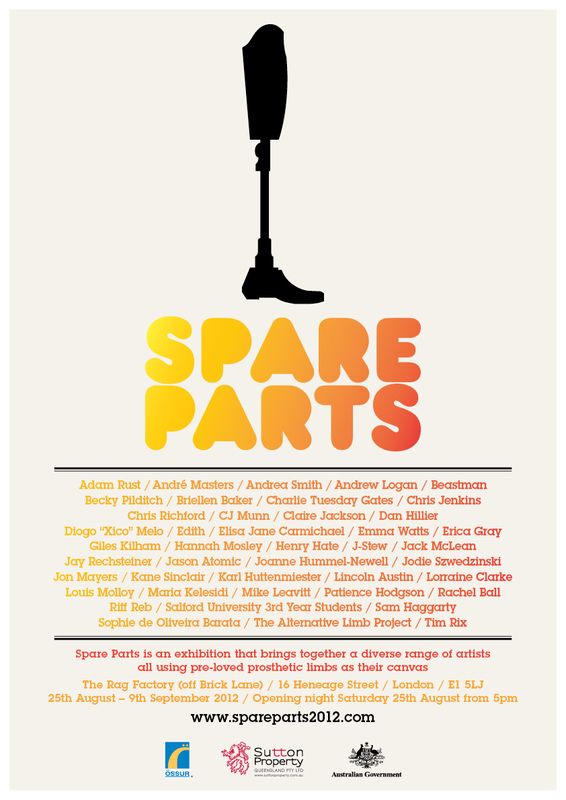 Spare Parts will be at The Rag Factory, Brick Lane, in London from 25 August to 9 September 2012.